There are those mornings where, for whatever reason, the day starts out and you are in slow motion, unable to catch your usual wide awake and ready to go status. Thursday was one of those. 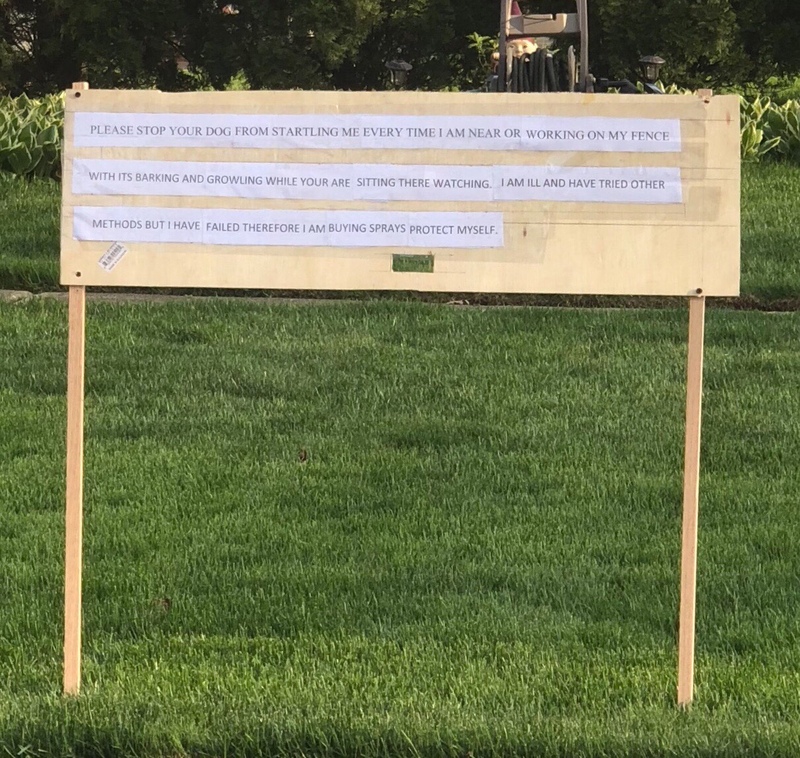 In the wake of a new sign on our neighbor’s yard, newly installed as I drove in the driveway, seemed to be an almost apology, saying that he was ill, and frightened by our ‘lunging’ dog (when Stewart sensed noise and movement on the other side, he supposedly lunged, thus bringing out the air horn). Needless to say, he is a dog and our neighbor, who has never, ever attempted to be friends with Stewart, has no apparent clue about dogs, or humans for that matter. It makes me think of the time that their deceased son had a dog named Molly, and how she lived with them after he died, and then how all of a sudden she was gone. There was a threat in the signage as well, a poorly written and almost hard to understand message of ‘sprays,’ making us think of some sort of spray one uses to protect oneself. The sign was of printed words on paper and taped together. One wonders why one doesn’t use words or maybe one’s spouse to relate the message. We know that is not possible. We ended up calling the non-emergency police number and the police came to talk to us about options. Basically there is nothing we can do until something inappropriate is done. Although somewhat threatening and wreaking of harassment, the current bullying has not yet gotten to the point of being anything that the law can react to. We all commiserated the fact that the hard part is that there is tragedy here and sadness and that there is really nothing anyone can do. Everyone felt somewhat better, execept for me, although it was nice talking to the police, I expected nothing really to come of it and didn’t really feel any better. The police did say that if they were called out on us that all they would do is park down the street to listen to Stewie’s perported barking rages and then tell the ‘neighbors’ that it wasn’t as bad as they said. So this morning, we got out of the house and were at our son’s house by 6:32 AM to wait for the kids to get up and then bring them to our house. I haven’t had any coffee yet, maybe that will help. Meanwhile, Stewie has on his new anti-bark collar.